We come highly recommended because we take special care to deliver a stress-free move. No job is too large or too small, and we offer a wide variety of moving services to fit any budget. ABBA PROUDLY PROVIDES SAFE, STRESS-FREE MOVES OF ANY SIZE TO OR FROM ANYWHERE IN THE NATION, GUARANTEED. Abba only employs professional movers who are each properly trained and insured. Our experienced crews have more than 20 years of combined moving experience, and we only employ the safest, most efficient moving methods. Each crew member is outfitted with the finest equipment and is sure to practice only the most advanced moving techniques. We never sub-contract your move. There are never any hidden fees, and our outstanding movers always treat your belongings as if they were their own. Our movers were fantastic. We couldn’t have been happier with their professionalism and every aspect of the move. Thanks for providing great service at a very fair price! Abba Movers are AWESOME! Errol made all of the arrangements seem effortless! Brandon and Allen were on time, efficient, professional and informative. They loaded and unloaded our belongings carefully and quickly. Mark and his helper were also excellent at the unloading. I would HIGHLY recommend Abba Movers for your m0ve – local or long distance! ABBA is the BEST! Was dreading first move after living in Baton Rouge for 65 years–these guys were so nice, so professional, so hardworking and the price was so reasonable that they made moving my life to N. Carolina as painless as possible! I simply cannot say enough good things about Abba’s crew! Very pleased with Abba Movers. Irvin and his coworkers were awesome. They wrapped up all the furniture as well as pointed out if there was an issues before moving. They were very well prepared and equipped for the task. Unlike other moving companies within Baton Rouge, they use safety belts and moving lifts which made moving easier allowing them to concentrate and move without worrying about dropping, slipping, and hitting the walls while moving the really heavy stuff. They were very well priced, lower than most placed I researched. I would recommend calling them and discussing your needs before hand. Other companies that are a little cheaper, did not provide adequate lifting help and utilities needed to properly do the job. Again, excellent team/company. We’ve used ABBA now twice and each time the service provided was absolutely outstanding in every respect. Their movers arrived on time and were extremely careful with all of our furniture, especially the fragile pieces. Both movers — Francesco & Steve were courteous and very professional. It was a pleasure doing business with ABBA and we intend to use them again. As always, Abba Movers was amazing! They were quick, efficient, and reliable. They maintained communication throughout the whole process, and were extremely professional while helping me move. I’ve used them several times, and will continue to only use them for my moving needs! ABBA Movers made my small move very easy. They were very professional, on time, courteous, and kept me updated and informed via email. I would recommend them highly. 5 Star service! This is the second time we have used Abba to move. This time we had a 4 man crew that moved us from one house to the next. Starting with the process of getting an estimate to the day of the move, everyone was very professional. Our team arrived on time and completed the work with no delays. The final cost was right in line with the original estimate we were given. Could not recommend a moving company more than Abba. Great experience all around! I would recommend Abba Movers due to the professionalism of the whole moving process from the initial contact to the movers. They showed up on time, were courteous and worked hard and finished ahead of schedule I will use again when needed! Abba Movers did a fantastic job moving us from New Orleans to Baton Rouge! The 3 guys that moved us were extremely professional and courteous. They were very efficient and took great care of our belongings. I would highly recommend Abba Movers and will definitely use them again in the future!!! Our movers were excellent- on time and very efficient for our small move. Will definitely use you again for our larger move. I highly recommend Abba Movers. We have used them twice now and both times were great experiences. The movers are efficient, friendly, and knowledgeable. Lolo is especially skilled at packing the truck tightly and securely. They take a lot of the stress out of moving! They showed up exactly on time; were quick and efficient and professional. Had to go up and down 3 flights of stairs for each load and didn’t complain at all. Delivered furniture to new apartment and unloaded just as efficient. I would definitely hire them again – excellent communication on status of appointment. Prompt, courteous service. They were awesome and we would definitely use them again. We’ve used ABBA movers three times and have been delighted with their professional service each time. They arrive at the appointed time and are extremely efficient and careful. In our three moves not a single piece of furniture has been damaged. We highly recommend them without even the slightest of reservations. Francesco, Steven, and Eric were terrific! Used Abba Movers after a bad situation with a Van Lines. These people were professional, efficient, and honest and took care of the whole move to another state in just 3 days. I highly recommend them! Please do not waste your time going through a van lines as they will screw you over and up your fees. Miguel, Chris and Frank were the best. Everything was moved in good condition and no task was too much to ask. They were professional, kind, considerate and fast. They felt like friends at the end of the day. Thanks, so glad we used y’all! I highly recommend Abba Movers! Scheduling is easy through their online system. I am sincerely appreciative they worked with me when I made changes to my request on late notice. Adolfo and Damien, my movers, were wonderful. They were on time, caring, honest, and hard workers. They made my move an enjoyable and stress free experience. Thank you! I would highly recommend ABBA movers! On the day of our move the movers showed up on time and got to work quickly. The movers were professional, courteous and very helpful. Thanks ABBA! Abba Movers did a great job for me. The movers were great. They were polite and work well together. I thought I would need them longer than expected. They got the job done In exactly 2 hours. I have moved cross-country six times, and this was the best experience I have ever had with a moving company! Errol, the Operations Manager, was an excellent communicator, very responsive, detailed and courteous. Also, flexible when we had to work with bad weather forecast. The quote was reasonable. The movers were efficient and pleasant, hard-working guys. Abba excels at customer service, meeting my needs, rather than making me fit their program. Very pleasant experience. The packing ladies did a terrific job, So glad I used them to pack the breakables. They love their work and it shows! We recently completed a move with Abba Movers. Brandon and Ivan were dispatched to our residence and courteously and efficiently loaded our furniture and transported it to our destination. On arrival, they unloaded and transported furniture up a 16 foot staircase and positioned it to our request. It was a smooth process and I would highly recommend them. We were very satisfied with Brandon and Ivan. This company was the best. After being shorted by a van lines, Abba came to our rescue! They came the next day, packed us up and delivered our goods two days later to another state. Very helpful, courteous and dependable people. Would recommend them with no hesitation. Thank you Abba! We have used Abba movers twice recently and have been more than pleased each time. We found them most accommodating and willing to assist us in any way. We wholeheartedly recommend them to others. Bernie Pereira and his partner were nothing less than professional! On time, kind, and very careful with one of my most prized possessions: my upright piano. Initially, due to a clerical error, I was not put on the schedule for the day I requested. However, when I called to inquire about it, Errol took it very seriously and communicated with me all the way through to the resolution. Good customer service does not mean we are perfect; it means we make it right when we make mistakes. Very pleased, all around. Thank you, Abba Movers! I am so impressed with Abba, the cost, the efficiency, the quality of the first person I talked to, and the young men who moved me. They are hardworking,respectful, careful and honest. Top notch service! Ivan and Miguel were total superstars and the hardest workers EVER, and took really good care when loading my belongings. I will definitely use ABBA again for my next move! The crews that came to unload both my containers were great. They showed up on time, worked quickly and efficiently and were very courteous and considerate. I’ve used them twice. I highly recommend. We utilized ABBA Movers last week in conjunction with Cardinal Solutions to move an elderly friend into an assisted living facility. ABBA was A+ professional, polite, caring and efficient with most reasonable rates. We highly recommend! Hired Abba Movers for a move in the French Quarter. They showed up on time, were very professional, and the 2 gentlemen that we had did a wonderful job. We had to shut down a street to move and their fast loading and unloading was very helpful. Would definitely use them again if the need arises. Great moving company! The guys were very fast and helpful. They were done before my minimum and took care of all of my furniture. Would definitely use this company again! This was the second time I used ABBA Movers. My repeat use was based on the great job they did previously. I highly recommend ABBA for all of your moving needs! Excellent job. Movers were on time and handled our furniture with great care….we have a lot of glass in cabinets and entertainment center and all was packed carefully so not to break it. It rained all day and time was taken off for the time they couldn’t load and when they went to lunch. I recommend them and would use again. These guys are absolutely fabulous! They were perfect in every way. I’ve moved a lot but I’ve never had better people. On a short notice Abba Movers were able to accommodate our company needs. The 3 man crew from Abba Movers reported on time and were very courteous and respectful. They completed the move in a timely manner and were very careful with the furniture and fragile pieces. I would highly recommend Abba Movers. We used Abba Movers for both loading and unloading our PODs. Both crews did an amazing job. They were friendly, professional and conscientious. They were very careful with how they packed and unpacked the PODs. We had zero issues with the condition of our furniture and belongings. They truly treated our stuff like it was their own. They also were very patient with us as we had them rearrange furniture a couple times. They made this portion of our move much less stressful! We highly recommend them and would use them again. I used Abba Movers for the second time January 26th. They were on time, very helpful, professional, kind, and respectful. I have and will continue to recommend Abba Movers. Thanks guys for a job well done! Thank you ABBA Movers for making this part of my transition positive. Movers were on time and moved quickly to complete the job. Being involved in several moves both residential and commercial, ABBA Movers made our recent office move a great experience. Their wonderful crew of movers were extremely polite and efficient. We will absolutely use them for our next move and could not be more thankful for their efforts. We had a really good experience. Abba moved us from New Orleans to Seattle! We had an excellent experience with Abba Movers. We would use them again without hesitation. Communication was amazing, we knew what was happening and where our things were at all times. All the movers were kind, courteous and very careful with our things. 5 Stars!!! ABBA movers are beyond your typical moving company. If you’re looking for individuals to take utmost care of your treasures and personal belongings too, they are your movers. They moved an entire home a 1000 miles & all was done as if I did it myself. They were on time, personable, caring and professional. I can’t find words to describe them highly enough! Hire them and you’ll be TOTALLY 100% satisfied. Thank you Abba Movers for your help last week. I was impressed by your professionalism, responsiveness, flexibility, and cost. You guys made moving a very smooth experience! ABBA Movers gave us a great move from New Orleans to Columbia, SC. Every step of the way they were super friendly and knew what they were doing. I was told exactly how the pricing would work upfront and that the only variance was how long it took the guys to load and unload. They were fast and it came at the low end of what was estimated!!! Our experience with Abba movers was very positive. Our family needed to make two moves in a couple of days, and everything went smoothly. The movers were on time, friendly, and were very careful with our valuable belongings. I will definitely recommend Abba to friends and family needing to move. Our first time using a moving company and not just doing it ourselves and couldn’t be happier. Great price, quick and respectful movers, and a 30 minute arrival window that was honored. Definitely recommend ABBA movers for your move. We just used Abba Movers for a local move. Irvin Hernandez was the team leader. He and his team were very kind and efficient. They arrived right on time and quickly began their job. They were very careful with every item they moved and were sure to communicate with us during the move as to what items were included. Abba Movers are as good as it gets. They called me the day before to confirm and were on time the day of the move. They expertly packed up all of my large, fragile items and worked tirelessly for 5 hours, even roping together items to keep them in place in the moving pod. When they were finished, one of the movers, José, walked me through the pod and gave me a general idea of where the more fragile items were stored. José and the other mover were professional, kind and hard working. I would highly recommend them for your future move! Abba Movers has our absolute confidence and support. One phone call assured us that we’d found the right moving company. We received an email and text confirmation within minutes and were reconfirmed until move day. Our movers arrived on time, were professional and pleasant. They efficiently wrapped and loaded, and carefully stored household items on the van. Most importantly, when we arrived at our destination, all of our belongings were intact and well secured. Abba Movers’ expertise is a thing of beauty. This was the first time I have ever used a moving company and it was by far the best decision ever for me. The 5 man crew moved very quickly, were very hard working and very pleasant to deal with. I would definitely recommend Abba Movers and will certainly be using them again on my next move! Reliable movers at a very competitive cost. Movers were professional and helpful. Arrived on time as previously scheduled via the website. Recommended ABBA movers to the person who purchased our previous residence. The guys are sweet and very professional. Due to my job, I have had to move roughly ten times in the last six years, and I have been using ABBA Movers exclusively for the last two years. They removed all of the stress I was having with other companies — they bring their own truck (which saves me a bunch of time and stress of having to reserve/pick up/drive my own moving truck, waste no time getting right down to business and take great care with my items. It took a while to find the right company, but I won’t be hiring anyone else in Louisiana going forward. Reasonable rates, professional personnel, and timely service. We were very pleased with Abba Movers. They were careful with our belongings. I highly recommend and would use them again. They were great!!! Lo and Dez were hard working and very professional! I usually will not review, but when a company completes a job as stated and on time with no added-on prices, also had courteous employees that worked with my wife because I could not be there deserves my time and I would definitely use them again. Abba Movers were prompt, pleasant, courteous, and very accommodating. I highly recommend them. Abba Movers moved my husband and I to another state. Even though they are rated 5-Star, we both made several phone calls inquiring about the moving process and care of our belongings. Our questions were answered professionally, courteously, and patiently. The billing was explained clearly and a detailed statement was provided. We both were very impressed at the way our belongings were protected and efficiently packed in the truck. The movers were professional and made sure that our needs were met. Abba Movers exceeded our expectations! The movers we used did a good job of moving my furniture into a storage unit. They were pleasant and worked as fast as they could. I would definitely use them again. I had great experience with Abba movers. They came Right on time. Very smooth move for me. Seth’s crew of Irv & Braden did a great job of moving me from Baton Rouge to Monroe, despite some problems keeping the truck running. They were professional the entire time and got the job done well despite the obstacles – I really appreciate the attitude of doing whatever it took to get the job done right! We were very happy with the moving services provided by ABBA Movers. The two young men who helped load and unload furniture and boxes were efficient and courteous. The price paid for their services was reasonable. Hopefully this will be our last move until we take up residence past the pearly gates. However if we ever again need moving assistance, we will not hesitate to call ABBA. Thank you. The ABBA movers were efficient, courteous and careful with the furniture as well as boxed possessions. Everything went smoothly. Couldn’t have asked for a more professional service. Would hire ABBA movers again and highly recommend the movers and the company. Abba Movers did a fantastic job with our family move. They were all courteous and worked very well, being careful with all of the belongings. Great moving experience with ABBA movers! I did use other movers in the past and every time I move I feel tired. I didn’t know moving (Baton Rouge to Tampa) could be this easy. Truly professionals! I would highly recommend these guys! I’ll miss them in Tampa for my next move! They did a great job! They were efficient, very careful not to bump anything or slide items across wood floors, nice, respectful. I have hired movers several times in this city, and this was by far my best experience. Abba movers were great. They were really easy to communicate with in the week leading up to the move. They were VERY flexible with some last minute changes and were accessible at every moment I needed them. The actual movers were great as well. They did a great job with our stuff and took really good care of everything. They were very kind and took direction well. I appreciated their speediness and their hard work! Abba Movers made moving as stress free as possible. They arrived 15 minutes early and the service only improved from there. They cared about my stuff and helped me in every way possible. We have used abba movers several times and they have always been very professional. We would recommend! Abba movers moved my antique piano into a rental trailer for me to get from Baton Rouge to Houston. I was very pleased with their cheerful, courteous service and the very professional and caring communication I received at every stage of the move, from planning to follow-up. Well done! Excellent group and moving company. Totally pleased. Will use them again when moving to new home. Thanks again! They did a great job. They were kind and understanding and helpful from the booking process to the completion of the move. Excellent movers! Friendly, easy to work with, and did a great job for a reasonable price! Highly recommended!!! I couldn’t be more happy with Abba than I am right now! The manager is wonderful. He answered all emails within minutes, replied to every question like a pro (Which very much is. ), and was very patient and courteous. If I ever need movers again, this is definitely the company I’ll use. His team not only arrived on time, but were very careful with all of my furniture and had a true willingness to help in any way they could. Excellent movers. Great communication and very professional. Handled our belongings with care and were very friendly. I have always said that I’d rather be beaten with a stick than move. After our move with Abba, I can now say I rather be beaten with a stick than move without Abba doing it for me. These guys are amazing! They were the hardest working group of guys and I cannot thank them enough for the work they did. They showed up on time, eager to get the large job done. I am so glad I received Abba as a recommendation on the Nextdoor app, and I would recommend them to anyone else needing to move! The two man team were very efficient and careful moving my heavy furniture. I would use ABBA again. We loved Abba Movers! They were on time, friendly and very careful with things. We would highly recommend them again for anyone moving. I would like to thank Abba movers for making my move to be a pleasant and stress free move. These guys were so professional and very respectable for my things. Awesome job guys!! Abba Movers did an exceptional job with moving my belongings from one location to another. They used a 3 man crew who worked diligently and carefully throughout the day. They showed the highest level of respect and professionalism. The price was awesome. They made my stress and nervousness go away placing me at ease. The manager was always available by phone or email and Abba provided confirmation emails, texts, and phone calls prior to the move. We could not be more pleased with their services! Thank so much to Ivan and his crew for the easy transition and the move to my new Apartment. These guys were great. Scheduled one week out and they were on time, very efficient and got our move done with little stress. Moved from a one-story to two-story home and they made it look easy. Highly recommend based on our experience. This was the first time I’ve ever used a moving company and honestly I went in to the day with low expectations based on various negative reviews I have read about various local moving companies. I’m happy to say my experience was fantastic. Communication was great from the day I booked through to moving day. Crew arrived when they said they were and were genuinely nice guys. They worked fast and were professional. Made my moving day a breeze. Highly recommended! I’ve used movers many times. These guys are the most professional. Prompt, courteous, careful, accommodating, fast and not overpriced. I couldn’t ask for more when it came to movers. After being highly recommended by a friend, I chose Abba. They were professional, honest and careful. They had a great attitude and were accommodating at every turn. I highly recommend them. Found Abba through Home Advisor and was very pleased with them. From speaking to the manager several times on the phone to the 3 movers the day of the move, everything was great. The movers were very professional and efficient. Nothing got broken during the move. I highly recommend Abba. Thank you for an easy move. I have used your movers for 2 moves, both times the employees were professional and courteous. I will recommend your company to anyone needing a stress free, professional move. My furniture arrived safely and was handled with care. ABBA Movers is a great company to work with. They did a fantastic job moving my 92 year old mother from Diamondhead, MS to Duluth, GA. The manager was very easy to contact and work with, and the estimate he gave was “spot on”!. The two young gentlemen that moved Mom were focused and took every care with her possessions. They worked steadily till the job was done; no time was wasted. I would highly recommend ABBA Movers to anyone. Hopefully they are still in business when one day I have to move. They will be my first choice!! Abba Movers are the best movers in Louisiana- hands down. They are prompt, professional, courtesy, and quite simply AWESOME. If you are in need of moving your precious items, do not hesitate to contact Abba. They are number one on Home Advisor and number one in my book. Thanks Abba Movers!!! Abba Movers provided courteous, professional service from start to finish. Scheduling my move was completed with ease. I was provided with an accurate, reasonable estimate. The gentlemen that handled the move showed up on time, devised a plan, and move all my belongings in a safe and efficient manner. I would definitely use Abba Movers again and I highly recommend their services. I am from out of State and have used Abba movers twice now. Both times they were prompt, courteous and dependable. The last move was chaotic due to Hurricanes and closing date changes but Abba was extremely flexible and showed up exactly on time when I needed them. The packing was professional and expeditious. They have earned my highest recommendation! ABBA Movers were ABSOLUTELY 1st class! I wouldn’t hesitate to recommend the company to anyone who is planning a move! I used ABBA Movers to transport many big boxes of books from one storage facility to another. The two young men who did the job were hard-working, diligent and pleasant. I had a schematic of how I wanted the books placed in the new facility, and they followed my directive, with good humor and cooperating together to get the job done. Great teamwork! I highly recommend ABBA Movers..
Our movers were excellent. They all worked very hard with a difficult move. Had a great experience with ABBA Movers- very organized, professional and friendly. Showed up exactly on time and the price was very affordable. Would definitely use them again. ABBA Movers did an excellent job in moving my belongings from New Orleans to Atlanta. They were very professional, on time, and willing to help me in any way they could. I would definitely use them again and will recommend them to anyone planning a move. Thanks ABBA from the Whittemore’s! The movers picked up and delivered my heavy furniture in perfect condition. Moving crew was polite and efficient. The manager was very professional and available to answer questions and concerns. He provided excellent follow-up/notifications by text and email. The pricing was competitive and fair. Very professional. I will recommend this company to other people. I recommend Abba unreservedly. My move was small but a bit tricky. I was liquidating a storage lot, with some items being packed in a POD for transport and some going into my home. In addition, some items were going from my home into the POD, and others being relocated within the home. The Abba crew strategized how to do it all swiftly and efficiently, and they were personable and pleasant throughout. I should mention also that the manager gave me lots of helpful advice over the phone on what materials I would need and where to get them at best prices. I will be using Abba in the future for any moving or storage needs. I was very impressed with the movers. From the time they arrived to the truck was loaded they were constantly working. They were very courteous hardworking guys who were on time and careful with my belongings. I would recommend them and definitely use them again. Very fair with pricing. Thank again. My move with ABBA movers was great! Competitively priced, excellent customer service, my movers were efficient, professional, and kind. Fantastic experience with the movers from Abba (Marlon and Doug)! They couldn’t have been more kind and professional!!! Will recommend to all my friends! Second time that I used Abba. They did an excellent job moving us and their crew was very professional. Would highly recommend them to anyone planning a move. So impressed with the entire Abba team! Booking was fast and easy, and my quote was very reasonable. The moving team was professional, efficient, and so nice! They showed up 15 minutes early and finished hours before we expected. Great experience – will absolutely use them for my next move. Everyone at Abba movers was terrific. The manager was great in helping me get scheduled and making sure that everything was timed just right. Irvin, Jimmy and Pedro arrived promptly and worked diligently to get my home packed up and moved into my new home. They were very conscientious and careful when moving my furniture and items into my new home. Very reasonable prices. They say you get what you pay for however in the case of ABBA Movers you get FAR more than what you pay for! The manager was so easy to work with, he was courteous and provided excellent follow up. Adolfo and his crew went above and beyond, as this was a military move, and they took it upon themselves to get the necessary weight tickets without prompting from us. His team worked efficiently and without stop strategically fitting way beyond what I thought would be capacity in to their truck. This was an out of state move but we didn’t have to worry about our things getting combined with other people’s belongings as they drove the truck straight through and unloaded the next morning, setting up and placing all the furniture lightening fast. I am also happy to report there wasn’t so much as a scratched leg, a chipped plate or a missing screw. Everything was delivered exactly as it was found. ABBA Movers took the stress out of a very stressful situation and I recommend them exclusively! Abba Movers is a first class operation from start to finish. Pre-arrival scheduling with the manager was professional, and responsive to the changes that came up. The unload crew were a pleasure to work with and immediately made us comfortable and confident we had made a great decision. Abba Movers made our move stress free. Arrived in a timely manner, worked efficiently, were polite & respectful. Will definitely use again if needed and highly recommend to others. It was a great experience. The guys showed up on time, they handled my things carefully, they were very polite, respectful and friendly. I will definitely recommend them or use them again. We moved across town in New Orleans. Our amount of stuff was unusual b/c we had tons of boxes and heavy woodworking equipment (we had moved from a house up north with full attic and basement a year earlier – this stuff was still packed/crated) as well as your typical furniture. The 3 man crew of 20-somethings were amazing – I could not believe how much was already out of the house within an hour. It took 3 hours to get packed, then they took lunch. Unpacking at the new house took about 2.5 hours. Plus the guys were polite, personable and intelligent. Moving day is so stressful…these young men knew what to do, how best to do it, and worked as a well-rehearsed team. There is really nothing that they could have done better…how often does that happen in life. Worth every penny! We hired 3 movers with a 26-ft. truck and these movers did a great job throughout the entire process. We decided that paying for movers would be less expensive than paying for a chiropractor and it was! Thanks ABBA Movers! We will be recommending your services! My experience with ABBA movers was 5 star. From the phone call to book ABBA to the movers and job that they did was first class, very professional. Everyone was very pleasant to work with! I highly recommend Anna Movers. They were on time, considerate of my needs, and it was no stress for me. Fantastic team made for a fantastic move! Very impressed with everything, from the person who took my request over the phone, the communication by text and email before the appointment, and with the two men assigned to help. I had a last minute request and called just a few days before the actual day of moving. Even though it was a busy day for them, they were on time, very polite, efficient and got so much done in such a short time. I had several large heavy pieces of furniture that had to be moved up a long narrow staircase in a historic house. They got everything in without any trouble and made it look so effortless. I highly recommend them, and will use them again next time I need help moving. ABBA movers did a great job. Showed up as planned, completed the loading on schedule, and met us at our new home in St Louis. Irving and Giovanni were great. I appreciated the hard work and effort that was put forth by your crew. It made my moving day that much easier. They were polite and respectful, and never complained about the work. The crew placed all furniture exactly where I wanted it to be placed and I really appreciated the attention to detail. All this and a great price. ABBA was a last minute referral, but from now on whenever my office is in need of movers, they will be the first moving company we call. They guys came as scheduled and knocked the job out in less the time they predicted. The job was completed in a professional manner. I would recommend them 110% to anyone. We had a wonderful experience with Abba Movers. They moved our furniture from Baton Rouge to New Orleans. They were very careful and respectful. We would definitely use them again and will recommend them to our friends. Abba moved us from Louisiana to Tennessee. We would recommend them without reservation. The company did indeed exceed our expectations. Every one of their representatives was courteous, positive, friendly, and knowledgeable. All interactions were pleasant, even at the end of the day when the guys had been working hard lifting heavy furniture, they were energetic and working to please us. We never heard a complaint. All belongings were treated carefully and arrived safely. Even a glitch in the billing was handled quickly and satisfactorily. This is a top quality company in our estimation. Hardworking, professional, and very polite. They also take direction very well. We used them to move out of our house when a tree fell on it and them move back in because they did such a great job! I recommend them highly to anyone. Moving from San Antonio, Tx to Baton Rouge, La. I found Abbamovers.com on Thumbtack. I was very pleased with them. They were on time, very professional, and the job ended up $500.00 less than what was quoted! Highly recommended! I live in Johnson City, TN, and my daughter lives in New Orleans, and I was looking for a moving company that would move her that I could depend on that would be honest and good. Well they were perfect. My daughter was so happy with the two guys that moved her. They were polite, kind and so nice. I would highly recommend them for any moving jobs you have. This momma was happy I picked Abba Movers to move her daughter and will keep their information to use again if needed. Abba movers were courteous and professional from my initial contact with the manager, to the moving crew of Lolo and Doug. They definitely took the stress out of this move. I would highly recommend Abba movers. I’ve now used Abba Movers 4 times over the last 2 months for small jobs (including carrying a 250+ pound 1920’s tub down from a 3rd floor bathroom for repairs and back up again when it was ready) and they have been great each time. They are on time, courteous and get the job done quickly, professionally and without any damage. And the price has been reasonable each time. It was pouring down rain and the gentlemen were having to move a very heavy and expensive piece of merchandise. They did it expertly and made sure not to track in and even took the time to center everything on the area rug and the lighting. I was very impressed and would highly recommend them again for any job large or small. They showed up on time. They moved everything I needed them to move. They were quite and polite. I couldn’t ask for more. Abba Movers is simply the best in the business. I’ve come to depend on them for all of my moving needs. My last move was the third in the past few years, and Ive used them every time. Dennis, Pedro and Jimmy were great! They were prompt, efficient and very professional. Thanks Abba Movers! While our move was delayed for 2 days due to severe weather, Abba Movers were on top of things and in regular contact. We had a new schedule in place from day to day, ready to go ASAP. On the day of the move, they arrived on time, friendly, cheerful and ready to work. They are very reasonably priced and work efficiently to get your job done. I would highly recommend them. From the quote, all the way to the moving team headed by Phil, Abba Movers was fantastic. Not only is the price fair, but they worked hard and came in under the time budget. I moved 2.5 hours away and Abba Movers made sure everything got there on time and in tact. I recommend them to anyone looking to get a move done efficiently. Thoroughly professional. They gave multiple reminders of the time set for the move in advance. Items were carefully moved and covered with insulation to prevent damage. The move was quick, courteous, and completely without mishap. I moved with Abba Movers almost two weeks ago and it truly was a great experience. Let me give a little background…I’ve lived most of my adult life in NYC and usually grabbed a bunch of friends to help when I was moving in dorms or into apartments. Everyone knows, moving in NYC is beyond stressful. I’ve also had the pleasure of working for a moving company while living up there, so having that experience made me really determined to do moves on my own. I moved down here with very little going into first place but moving this time, I knew I was going to need help, especially with the larger pieces of furniture. I made sure to do my research and Abba had the most glowing reviews. Contacted them through Yelp and the manager was very helpful answering all my questions. On the day of the move, they were only four minutes late. IMO, that’s early as moves rarely happen on time. There was only one other minor hiccup, they had forgotten their tools but I’m used to things like this happening, so I had no problem being flexible. Phil and Seth (?) were great, friendly, and made this move go as quickly and smoothly as possible. If I ever have to move again, I will be using these guys. Not only are they great at what they do, but they are reasonably priced. This was my first official move with movers and I truly felt like I was in the most capable hands. I’m grateful for the positive experience. Thanks guys! I highly recommend this company. I was looking to move a 2/3 bedroom house full of furniture from a storage unit to my townhouse and ABBA’s New Orleans location moved me within 2 days of placing a call with the manager. Everyone from start to finish were friendly, professional, and dependable. The movers were fast and efficient. If I ever move again Abba Movers will be my first call! I hired Abba because of their great reviews so I want to put mine. I never hired movers before and let me say, they did a great job. I had a 3 man crew from Louisiana to Texas and they were so nice, friendly, played my with my 5 and 2 year old boys, as they wanted to hide from them and scare them. It makes all the difference when your kids are around and the movers are playing around with them to make them feel even more comfortable. Our move unfortunately was hit with a death close in the family at the same time movers showed up, so we had family members showing up, crying, and they were very considerate to everyone that was around. On top of all this, we packed the boxes, but there wasn’t anything broken, they packed the truck so well we would have NEVER been able to do that, we would have needed 2 trucks if not 3, but they did it in one. They took care of all furniture with blankets as to try not to scratch it. You will get the normal little dings, but you get those just moving sometimes. I will/would hire them again for all my moves! Well worth it! If your considering hiring them, these are the guys, I am one that always reads reviews before hiring or going somewhere, and these reviews don’t say enough good about this company! Abba’s team was very professional and accommodating. It was the easiest move I have ever had. They were on time on both ends of the move. Abba Movers did a fantastic job — on time, reliable, efficient! Made our move so easy and were incredibly reasonable — no surprises at the end. Brandon and Roberto were polite, personable, and communicated with us throughout the move, and the manager was great about coordinating with us and making everything run smoothly. Thanks, Abba Movers! Abba has moved me twice now, and they never fail to do a wonderful job. Would definitely recommend and will definitely keep using Abba! I’ve used Abba Movers several times now, and it has been a positive experience every time. They are hard-working, honest , efficient, and on-time. I will definitely use them for my next move. Our move was made affordable and on-time using ABBA . Although the manager did not come onsite to provide a quote, he was able to determine the exact cost based on our discussions. The movers provided excellent service and worked with care during the entire process. A note of importance is the claim process. Many moves have accidents and this move was no different. We had a piano and many antiques moved and with that came a couple of small issues. The manager was very responsive to my claim and his company took the responsibility of either repair or pay for cost to repair. Unlike many moving companies that throw the claim back onto the moving crew and you may never get a resolution. The manager was also receptive to suggestions to reduce the risk of damage. I would hire them again. ABBA for any moving that I would need to do. Highly recommend! Positive attitudes and hard working staff. I would use them again. Abba movers were courteous and efficient and reasonably priced. I used them for three moves and would use them again. Everything went smoothly from the reservation to movers-timeliness, price and efficiency. The movers were great guys! I will definitely use them again. The best move I’ve ever experienced. Very accommodating with scheduling. They were very professional, courteous and timely. Great job! The two movers assigned to the job were great. They worked very efficiently and took great care not to damage my possessions or the floors/walls of the apartment. The rate seemed fair and was very much in line with other moving companies in the area. Given my initial experience, I will definitely be using Abba again when I need movers. Great guys helped us move. Great service and the moving team worked extra to get us moved in a safe and timely manner. So happy that I chose Abba! They were great! Very efficient and hardworking, and courteous. I was moving stuff for a one bedroom apartment and they got it into the truck in about an hour and a half. Would definitely recommend to anyone who is considering moving! Used three years in a row – fabulous company! On time, friendly, and quick response to book. This was my very first occasion to use a moving company so I wasn’t sure what to expect. I could write a thesis on my experience but I’ll just tell you that I could not have been more satisfied. They communicated with me constantly and were available for any questions or concerns I had prior to the move. They were prompt (actually a smidge early) and the 3-man crew worked diligently so we could depart at the estimated departure time. They were so accommodating and didn’t mind at all making an extra stop at our storage unit before unloading at home. Their rates were very reasonable. As a matter of fact, it cost LESS than the quote I was given. Someone less honest could have charged me the quoted price and not thought twice about it. As I said before, I truly couldn’t have been more satisfied! I HIGHLY recommend ABBA Movers and will use them again should the need arise. Thank you Abba Movers. My out of town move was handled with the utmost in professionalism, promptness and your services were right on point and exceeded my expectations. Irvin, Ernesto and Jimmy did a great job for me and I have recommended your company to others. Keep up the good work guys! Our moving experience with ABBA Movers was easy and carried out professionally from my first phone call until the completion of the job. I can highly recommend this company. The two man crew was excellent, and knew how to get things done expeditiously! They were courteous and professional. Abba Movers were awesome. Easy to get in touch with, very professional and extremely efficient. They arrived early, worked all day with hardly any breaks and had a very fair price. Recommend everyone to use them! Abba Movers did an exceptional job moving our office. They used a 6 man crew and accomplished the move in one day. The crew worked diligently and carefully throughout the day, while showing the highest level of respect and professionalism. And, they did all of this at a very fair price. One thing I really liked is the ease of communicating with them. The manager was always available by phone or email and Abba provided confirmation emails, texts, and phone calls prior to the move. We could not be more pleased with their services! Thanks Abba Movers for making our move stress free and easy. The men were polite and professional. I highly recommend Abba Movers. Great! Ervin and Pedro worked quickly and efficiently. The 4 men moving us were very personable and professional. The one in charge, Irvin Hernandez was polite and a very careful with all our belongings. I have given Abba’s name to anyone who may be interested. Thank you for making our move as easy as possible! We actually used ABBA movers twice within one week to move into our new house and were extremely satisfied both times. My first contact was with the manager, Nick. His very professional, friendly demeanor left me feeling confident about my choice of movers. We had the privilege of working with 2 different 3-man teams. Both teams were extremely polite, very professional, and had great personalities! They put furniture and boxes exactly where we asked them to. They worked quickly, but were always careful with all items. Moving IS very stressful and I would HIGHLY recommend ABBA movers for any job…..large or small. Movers stayed in touch through e-mail and phone so that I always knew status and what was happening. Showed up exactly on time and carefully but rapidly loaded my goods onto their truck. Hauled our goods to another place where we had contracted for long move and storage. They unloaded quickly and helped us make everything for and tie down securely. Accepted payment right then as we finished and I knew everything was done well! Wish all movers I have used were as wonderful as these! I won’t move again without the crew from ABBA movers! This was my 2nd move with them and I was just as impressed with their efficient skills as I was with the first move. I highly recommend them for small or large moves. These guys handled my furniture and boxes with care. They are easy to get along with and work in a professional manner. Be smart and use this company! This is my third move with ABBA and they are consistently dependable, thoughtful and efficient. Thank you, ABBA! My movers were fantastic! They ensured that my furniture and other belongings were securely packed to endure the 14 hour drive to Chicago, and they did a FANTASTIC job!! Both gentlemen were courteous, engaging, and professional! Thank you so much for making such a stressful task more manageable! Our furniture was moved by a not-so-good- quality (so we discovered after the fact) company right after the flood. We changed to ABBA Movers to move us back into our house…difference like daylight and dark. A very precise team, took great care of our furniture, made me sorry that I did not contact them first. One cannot go wrong with this professional business…they cover all bases before, during and after the move. Thank you, ABBA Movers, for your services during this stressful time. Alfonso and Irvin were extremely helpful and professional, timely, effecient, and knowledgable. Have used Abba movers before, currently, and would absolutely use them again. Thank ya’ll so much for all you do and for being so great! I recently used ABBA Movers and would highly recommend them to anyone needing help with any type of moving needs. From the start, Nick made it obvious it would be as stress free as possible. His very pleasant and accommodating manner assured me I was on the right track. He was always available to answer my many questions with great patience, as this was only my 2nd major move. And I had questions. Poor Nick. He was great. And he sent a great team to take care of the move. Jean and Juan actually arrived early and were ready to go. They were extremely polite and especially proficient and efficient. I will surely call on ABBA for my next move. This is the third time I’ve used Abba Movers. They always work hard, work fast and work carefully. The prices are beyond fair and I would recommend them to anyone! Thanks for the great job. Your men were very polite and professional. Although it was a long day’s work, no one complained and everyone seemed to know their job and to do it with enthusiasm. It was so nice to see how careful they were with my furniture and nothing was damaged. I’ll certainly use your company again and highly recommend you. I was extremely satisfied with the moving experience. The workers were very polite and worked efficiently. They arrived on time and worked straight through lunch. I called to have furniture moved in our office. Mark was very helpful and very accommodating. The appointment was made and the men showed up at the time scheduled. They came in, were very professional and did just what we wanted them too. They were very careful moving furniture around the office and were very careful with doorways and floors. I was exceptionally pleased with my choice of using ABBA Movers. They required no contract, no upfront money – was like an old fashioned handshake agreement – all done by phone. They were prompt, friendly, efficient and got the job done. I would definitely recommend using them to anyone who asks. Couldn’t have asked for more conscientious group of men. They conducted themselves very personably, yet very professionally. David, Miguel, Kwan and Gene were tops. If you’re reading this and saying, “could they really be as good as all their reviews?”–the answer is YES. Great experience. Abba movers did a fantastic job. They moved our belongings efficiently to our new home. Our bed was broken in the move but they were very responsive and provided a check to replace it the next day. The crew was on time and did a great job in moving our 2nd floor apartment. Thanks! This company really lives up to their motto “Take the Stress Out of Your Move”. The young men who performed the moving services were professional, efficient and all business. I am so happy I found this company and though I pray I never move again, if I do, then they will be the ones I call. A great, great company and a good experience. Guys were on time, careful with our things, very patient, and considerate. They worked hard and we thought pricing was fair. Would recommend them and would use them again. These guys were great to deal with. Very professional and on time. I even referred them to my local storage units for anyone looking for a good reasonable priced moving company. I will definitely be using them again. Workers were very polite and great with handling our possessions. We would recommend them to anyone who is moving. David, Brandon and Pedro made our moving experience stress free. They were very professional. I will recommend them in the future. I was in a state knowing no one & needing help to move my son. I did have unusual needs & movers didn’t want to help me until I called ABBA & Nick answered the phone. He cared about me! Someone actually cared! He saw that all I needed was done! The 2 helpers that came did everything to help me! Yes I recommend Nick & his team to anyone ! They are actually here to help you! We’ve now used Abba Movers three times. We’ve had horrible experiences in the past with different moving companies. After discovering Abba Movers we’ve never looked back. They’re professional, efficient, and exceed all our expectations. I could not recommend this company enough. Every single employee we’ve had contact with, regardless of phone, email, or in person, has been nothing short of stellar. Our most recent move from FL to LA went flawlessly. Our move fell within weeks of a family tragedy; Nick was gracious and never blinked when I had to possibly change plans last minute. Thank you, Abba Movers. I hope we don’t have to move again any time soon, but if we do, we know who to call for the fourth time! Great job on moving furnishings from warehouse to condo. Would use again if needed and recommend to others. I hired ABBA movers to help us pack a truck of about half of our furnishings to move to PA. 3 men worked for over 2 hours carrying heavy boxes of books as well as fragile kitchen and dining dishes. They moved some very heavy furniture as well. My husband and son drove the 26′ truck and felt that it had been packed efficiently and with great care toward balance and ease of driving. They had no problems driving the truck. The unpacking process at the destination went very smoothly because the of the care and skill that had gone into the packing of the truck. We really appreciated the work that ABBA did for us and I would recommend them for anyone who needs movers. They delivered excellent service. Hired this company based on customer reviews and was not disappointed. They showed up on time and were very efficient and careful with our furniture. There were no hidden costs at the end. I would definitely use them again. I would definitely use them again. They were extremely careful with everything. Abba Movers is the easiest company I have ever dealt with. I had an emergency move situation that caused the date and time to change continuously. Nick was extremely understanding and accommodating, and the move was made exactly on time and professionally. Relieved my stress, and all this at a very reasonable price. Would definitely recommend Abba Movers to friends and family! I am so grateful for Abba Movers. They were courteous, efficient, and took extraordinary care with our belongings. I would recommend them and use them again myself should the need arise. Jimmy arrived on time, introduced themselves, and immediately started to work. They took special care with all of my items by wrapping and tying down what needed to be. They moved at a steady pace and was finished in no time. I will definitely recommend ABBA MOVERS in the future. Called and showed up on schedule. Very polite and conscientious employees. Would use again. The 2 young men that helped us move back to our home were knowledgeable, friendly and professional. We were very pleased and felt confident in their ability to safely transfer our belongings. We highly recommend them for a stress free move. This was my second move with ABBA and everything went smooth, again!! The best moving experience I have ever had. Giovanni and his Team were professional, courteous, and hard working. Could not have asked for a better experience. Would highly recommend them. This is the second time that I’ve used this company and again I was not disappointed and very pleased, they are super efficient and courteous on time take care of your furniture and overall just a really good experience. I had them clear out my storage unit and it was great can’t say enough about them. Abba movers made a very stressful time better. They were on time for both moves, courteous, and reliable. I highly recommend them to make your move less stressful. Very Professional, extremely efficient, polite. Highly recommend. Brandon and Carlos were amazing. I had a lot of stuff packed into 2 bedroom apartment, and they had me moved in just a few hours. I was so pleased. They were polite and had wonderful attention to detail. I would certainly recommend them to my friends and family during a move. Efficient and professional. Excellent and timely job done. Loaded entire storage unit neatly and secure. Brandon and Carlos were so sweet and they moved FAST. I was so impressed by them. I will definitely use ABBA again, if I ever need to move. Excellent! Fast and efficient. Reasonable price. Abba movers did a great job helping us with a local move. The one thing that stuck out the most was the demeanor of the movers. The young men were gentlemen throughout the whole move. It took 13 hours and I never heard a negative word from them. They kept up the please, thank yous, yes sirs and ma’am all day long. I was very impressed with the way they held themselves. Great great great movers and very pleasantly. Moved my furniture with care and in a timely manner. I shopped around to find the best movers and I was so excited to find Abba!! They did an excellent job moving a big house and our office. Very professional and friendly. I would recommend them to everyone!!!! Irvin And his two cousins did an excellent job with everything, and believe me we had quite a mess for them to deal with. We had to move from a disaster/flood damaged home with items stacked from “POD, patio, shed to carport. Very professional, paid a lot attention to detail. Nothing damaged. Even rehung our door at our new home after appliance delivery service had left area. Great job! ABBA was great! The staff arrived right on time, got right to work and did not stop until all was done. John and Franky were very professional, courteous and careful! The best moving experience I have had!! I will definitely recommend them to anyone getting ready to move! These guys were awesome! We are so appreciative of them. They were as nice and patient as could be. They did a great job helping my family move from New Orleans to Little Rock. Brandon and Ivon were professional, courteous and worked really hard for several days. I would use them again! Abba Movers arrived early and were very attentive to detail. Handled the high-end furniture very carefully and delivered it timely to next destination. Everything was unpacked and properly placed in the new location. It was a pleasure to deal with Mario and Fernando. Abba was very accommodating to all of our needs. We had to reschedule 3 times and they were really great about it. The movers were on time and very professional. I would strongly recommend this company. Abba moved several pieces of furniture for me from an apt to a storage unit. I was very impressed at how fast and efficient the movers were. The two guys were hard-working and knowledgeable about how to move all sizes and shapes of furniture. In addition they were polite and cooperative. I plan to use Abba on my next move also. My movers, Wes and Giovanni, did an excellent job. Our lake house was down a steep hill and the new house was also down a steep hill. That meant, they did a lot of carrying up and down steps and hills. They didn’t whine, like my sons do. Excellent care of my possessions. I’d hire them again anytime. Terrific small move from New Orleans to Austin. Can’t recommend Abba Movers highly enough. Prompt, very courteous and professional, and super careful with our stuff. Will use them again for sure. There is no company better than ABBA! And I’ve used many! Good job moving furniture & placing in storage after the flood….Thanks. Incredibly efficient and professional at the right price. Absolutely fantastic. Fernando and his crew were prompt, cautious, courteous, efficient, and smart. They did a perfect job packing our truck for a cross-country move. We did not know anyone at our destination move, so it was a relief to know that help was available. The two men arrived on time, were courteous, and careful with our belongings. The charge was exactly what we were quoted, so no unpleasant surprises. We are very pleased with the service we received. Thank you ABBAA Movers! Super job great movers. Efficient, Great work guys! I have used ABBA movers twice in the last month. The communication is excellent from reservation to final invoicing with updates along the way. A confirmation email was sent as soon as I hung up the phone and invoicing was emailed immediately after the work was completed. Crew arrives on time and are very easy to work with. Furniture was handled carefully and I had no damage. I strongly recommend ABBA movers for any of your moving needs. From start to finish, Abba Movers gave us top notch service. The crew was fast and friendly. I couldn’t have been more pleased! Fernando’s crew is who helped me move. We were getting new carpet so all the bedrooms in my home had to be emptied. I did not want to pay for extra storage so I told them I wanted the stuff moved in my garage and other empty spaces inside. They did a fabulous job. I have never seen something packed so tightly and neatly. I would surely use again. Super professional team! Will highly recommend & definitely use again! Fernando’s crew did a great job! They were really pleasant to work with. They were careful with all my furniture and used furniture pads and shrink wrap to protect all my pieces. They even tied string across the truck to keep items in place and packed the truck to perfection. They were just plain nice and professional. I would definitely recommend them and will use them again! Oh, did I mention they understand how to angle overstuffed chairs and a large couch through a narrow doorway without causing damage to the furniture or the door?!! Professional. Simply professional. Abba Movers was the best and most efficient movers I have used in the past year. The men were professional, friendly and very careful with my furniture and boxes. I have no complaints and highly recommend them to anyone who needs a mover. I will certainly use them again. Kudos to Abba Movers!! 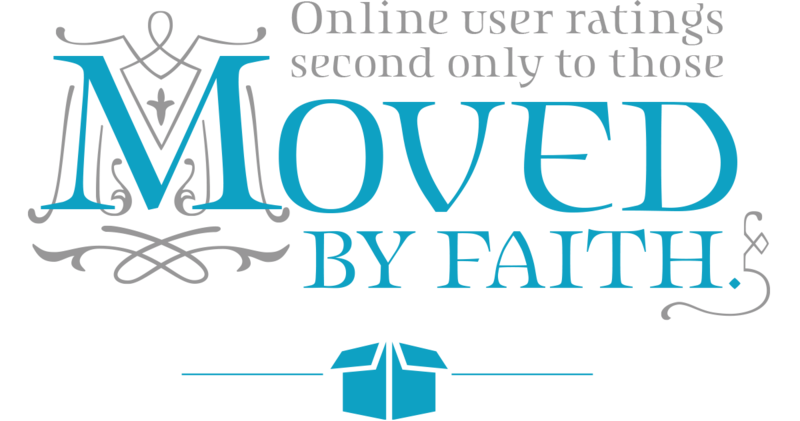 We chose ABBA movers because of their Christian background. We were not disappointed in the professionalism of our crew and the price for the services we received. They made a long, tough day, very pleasant. Gino, Juan and Phil were great. Nothing was scratched or broken. That was amazing. Another mover tried to speak bad of movers in general. Would never use him. For the second time, I was taken care of with my move by Abba! They took very excellent care in getting my home moved across town. Thanks to Wes and the team that moved me!! I will totally recommend them for any type of move. Arrived on time, worked hard & took proper steps the entire way to make the move less stressful…Thanks ABBA!!! I had the Fernando crew do my moving for me. They were AWESOME. I was getting 4 rooms of new carpet put in my house and 4 bedrooms painted. Their task was to move all the furniture from the bedrooms to my garage and other available parts of my house. They stacked everything amazingly. I was so pleased with all their work. It helped out my husband greatly too, because he is quite limited on time. I would definitely recommend Abba Movers and will surely use them for my moving needs in the future. I saw their ad on Angie’s list. Great job Abba Movers! Fernando and his crew were amazing. They were fun and really packed every inch of the truck. I was pleased with them. We were very pleased with the work Brandon, Brian, Jean of ABBA Movers did in loading up our stuff. They were courteous, polite, and really impressed us with how hard they worked. The fact that they could move big chests without us having to empty them, was a great benefit. It was a hot day and the only break they took was to hydrate so they could keep going. They were very careful with our stuff and we only had one scratch on a doorway from squeezing the refrigerator through. The scratch just took a little paint to repair. The truck arrived as scheduled in Frisco and the two helpers for Brandon were also very polite and hard workers. We will strongly recommend ABBA Movers for any local or cross country moves. We used Abba for a long distance move from Baton Rouge to Houston.. Abba sent a two-man crew. David and his helper were very professional. The moment they arrived, they wasted no time and started loading their truck. The crew were very courteous and very careful with the move making sure they do not damage any furniture. Upon reaching Houston they showed the same professionalism with unloading the furniture and boxes. Nick had provided a range for the estimated cost and stayed within that range upon completion of moving. I would highly recommend ABBA movers and David and his crew to anyone looking for a stress-free move. Abba Movers is wonderful! Their services are great and the prices are very reasonable. Nick coordinated our move over the phone and listened to and accommodated all of our needs. Our movers, Juan and Frankie, were very efficient, patient, and kind, and we had a nice time talking to them when we took a lunch break together. Note: Abba Movers did not charge for the break time or the time that it took to get the truck into the loading zone, which took over 40 mins (other people had parked illegally in the spot we needed, and we hadn’t thought to make sure it was available for our appointment time). We will definitely be calling this business back when we have to relocate again in a few years. If you are shopping around for a moving company, look no more – Abba Movers is it. And please generously take care of your movers at the end, if you are able to – they do not expect a tip at all, but they were so thankful when we did. Again, thank you Abba Movers! Prompt, friendly, respectful – highly recommended! Abba Movers assisted my wife and I in our move t0 FL. They were terrific. They were on time and my furniture was delivered as expected. We would recommend Abba to anyone that asks. Careful and swift.. The two most important things you look for in movers.. They were great! Fernando and Jeffery were both awesome. A very professional, competent team of movers. Our second time using their services. Always prompt, efficient, & very careful with furnishings. Highly Recommend! Our movers kept in contact with us throughout the day. It was a very rainy day, but the movers were prompt and tried their best not to track mud in the house. They worked hard and got a lot done in a short period of item. I would recommend them definitely. Abba Movers made our transition awesome. We are thankful for the great job they did and would hire and recommend them anytime in the future. From the beginning to the end, Abba Movers was professional and courteous. The movers showed up on time, and were efficient and friendly. I had them move my daughter’s belongings to a storage unit, and it couldn’t have been any smoother. Thanks again, Abba Movers. Move from New Orleans to Houston with out any problems. This was the second time using Abba Movers. It’s sad the next time we move they won’t be here to give us the best service we’ve ever had. Will miss you guys!!! The guys were great, polite and professional. Could not ask for a smoother move. The 2 guys that helped me load my belongings into a POD were the BEST! They were very kind and respectful. Definitely will use this company again. Thanks so much. The guys came in and were very professional and got right to work. The really organized the POD we had in such a way that we got more into it than we thought and they tied down everything securely. They were awesome and the right guys for the job. When we get to Texas we will use their services again. Abba did several moves for us. First to store some big furniture items to storage to stage our condo for selling. After the sale, they moved our necessary furniture into a apartment while our house was being built and the rest into our storage unit. When our house was complete, they moved everything. It was a great experience and I highly recommend them! There was confusion about needing packing boxes. NO PROBLEM. They moved what they could, got boxes, packed things up, and made the move perfectly including a really challenging piece. THEY WERE GREAT. Excellent service from start to finish. Very courteous, efficient, and honest. I would definitely use Abba Movers again! Great company. I have used them twice and both times were great. Very nice guys and hardworking. Work very fast and efficient. I have used them both with my own moving truck as well as using their truck. I recommend letting ABBA provide the truck as it make things easier and they have a large truck. Completely satisfied with their service. Both Juan and Fernando worked hard and fast to get us loaded up. They were on time and ready to work. Very friendly and courteous. Will definitely use them again. Our moving with Abba was so smooth. They are very professional and nice. They were careful with my furniture and belongings. I would use Abba again and again if I needed to move. The one word to describe this company is excellent. The guys were great, they were friendly and polite and worked hard the whole time to get the job done as quickly as possible. I can’t imagine how difficult it would have been to handle the move without them. Easy to work with, on time, and did not break anything. Movers were very pleasant and worked hard! Took longer than we thought but had more to move than anticipated! Very professional and did a wonderful job. Highly recommend! Good, consistent moving services. Have used several times and will continue to do so. Extremely careful, professional, and on point. I needed help within 24 hours to unload two 26 foot trucks. Abba was prompt and the movers were extremely careful. I will definitely recommend! Abba Movers were very efficient, timely and professional. We will be using them again. Great job! Very punctual and will use them again to unload my goods in our new home. Everything went off without a hitch. Abba moved our office on time and on schedule with no damages. The movers were professional and had all the right equipment. I would use them again. The two movers that were sent were energetic and very knowledgeable on how to pack a truck. Without being asked, they brought appropriate equipment for the move which was better than what I had rented from U-Haul and made short work to load my items. The guys were quick, professional and courteous. The movers on the other end were impressed on their truck packing ability. I would hire them again without any reservations. My boss actually recommended them to me and I am so glad that she did- Professional, on time, hard working and affordable! We will without a doubt use them again. The guys they sent were very hardworking, fast, competent, and NEVER GRIPED. In my experience with movers that is pretty rare. The only minor hiccup was an arrival time 15 minutes past the scheduled start time, but that was due to Uhaul being unable to ever do anything in a timely fashion. Aside from being polite and professional, they were very careful and conscientious with all of my furniture. I would use them again in my next move. First off ABBA Movers- wow! So nice and efficient. I was moving from an upstairs apartment on a very busy New Orleans street and they were able to move me out and into my next apartment in only two hours. Granted, I am only one person but still have many things and a lot of furniture. The truck is large and equipped with anything and everything you need for moving. It was very easy to schedule the movers, very accommodating with my schedule. I’ve had two other moving companies before and these guys were cheaper and very quick. No scratches or damages to any of my belongings. All in all, 6 out of 5 stars! It is rare that anything is worth a perfect rating, but Abba filled that bill for us. 4 Abba movers showed up on time. They were very cheerful and respectful with us during the entire move. With respect to their work, they were diligent, efficient, resourceful and conscientious – ultimately, experienced and caring professionals. No items were damaged during the move. Final cost of the move was very reasonable. Thank you Abba for the stressless move. Great job! Easy to schedule. Prompt arrival, kind, and quick! Fast, efficient, reasonably priced and all 4 guys were super nice, polite and hard workers. Would absolutely hire them again. I couldn’t be more thrilled with my service from ABBA. The guys were very professional, friendly, efficient, careful, and went far beyond the call of duty. I would recommend them highly, as they were highly recommended to me. I would never use another moving service. Abba helped us move twice in 3 months; they were timely, competent, and friendly! Nothing broke. Quick and careful. It has been 4 years since Abba Movers helped my husband and I move in-town. The two men they sent were personable and relaxed, but very hard workers who did not complain about some of our very bulky furniture. The job took longer than we anticipated, but not because of anything Abba could control, but at the end of the day nothing was broken, scuffed or disheveled, and my husband’s and my own back were very thankful for Abba’s hard work. Abba Movers were very friendly and professional. Would definitely recommend them! Was in a pinch to move fast, and received a response to my e/mail inquiry immediately … On a weekend! Was able to schedule for my desired date and time on short notice, and they we’re prompt, courteous, and efficient. Great experience. And, best of all, they had the best price!!! Highly recommend. I would recommend Abba movers to anyone. They were fast, on time, very professional and the quote was spot on. This is a very trustworthy company I would use anytime!!! Best move ever, and I have had a lot of them. They took care of everything, went above and beyond the normal job. Great attitudes, personable and professional. Above all trustworthy and efficient. Highly recommended! Movers showed up on time; did a really good job of moving my stuff and honored the price given over the phone. I would use then again. Excellent service. Friendly, prompt, and professional. I highly recommend Abba movers. Prices were fair. They were easy to work with and took care of our furniture. I used ABBA for a business move and a personal move. Extremely satisfied! Abba has always been on time and worked hard on my moves. They gave me good prices and never exceeded their quotes. I will be using them very soon again. The guys were careful and safe in moving my belongings. I would use them again.